The San Francisco market definitely cooled after the overheated feeding frenzy of the first half of the year. The competition between buyers for new listings declined to more rational levels: Homes that might have received 5 to 10 offers earlier in the year received 1 or 2 or 3. Values in many of the city’s neighborhoods plateaued or even ticked down a bit after spring’s big spike – the exception being districts with the most affordable house prices (under $1.2 million) where prices generally continued to tick up. The number of expired and withdrawn listings jumped 18% August through October when compared to last year, to over 460 listings, as buyers decided many sellers were pushing the envelope on prices too far. On the other hand, as seen in the charts below, the autumn market has been very strong by any reasonable measure, just not one of utterly crazed competition. The number of house and condo sales was a little higher in October 2014 than October 2013, and that doesn’t include a very large number of high-end, new-development condos that went into contract. Most of the city’s listings have continued to sell quickly for well over the asking price and luxury home sales hit their highest number ever. The market for multi-unit buildings did decline dramatically, but that was due to Prop G fears. Since the proposition failed on November 4, that effect should quickly dwindle. Meanwhile, buyers have a large inventory of 2-4 unit buildings to choose from. 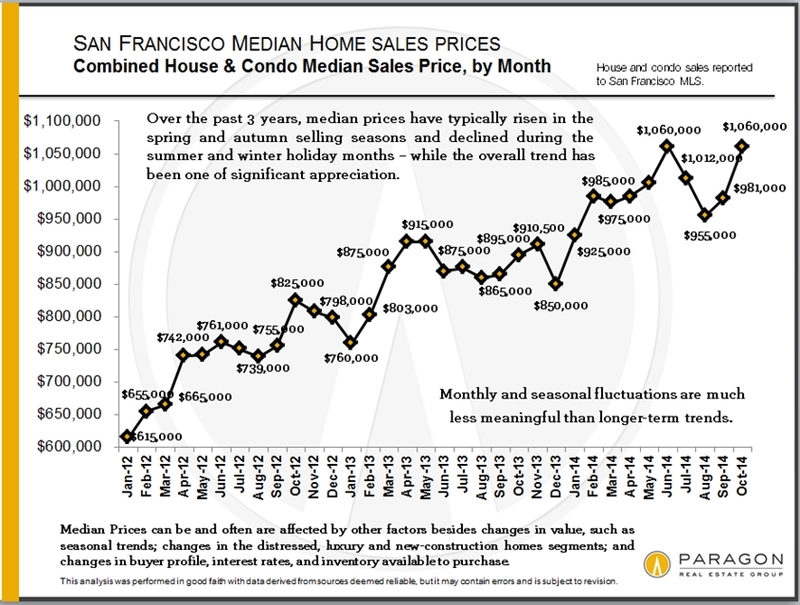 Median Sales Price by Month: Median prices are affected by other factors besides just changes in home values, such as seasonality, inventory available to purchase and significant changes in the luxury market. It often jumps up and down by month and season: It is the longer-term trend which is most meaningful. In this chart above, the spring spike, summer decline and early autumn increase are clear. Among other factors, luxury home sales usually jump in spring and autumn and drop in summer and mid-winter, and this rise and fall affects the overall median price. For the last 3 years, the general trend line has been dramatically up. 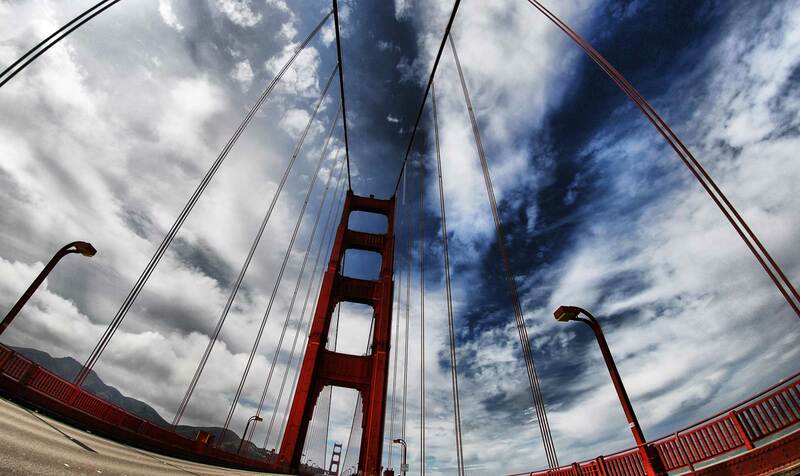 Homes Selling Over & Under List Price: As seen in the 2 charts below, an astounding percentage of San Francisco home listings continue to sell over, and sometimes far over asking price. However, an increasing percentage of listings aren’t selling at all: A hot market doesn’t mean buyers will pay any price sellers dream up. 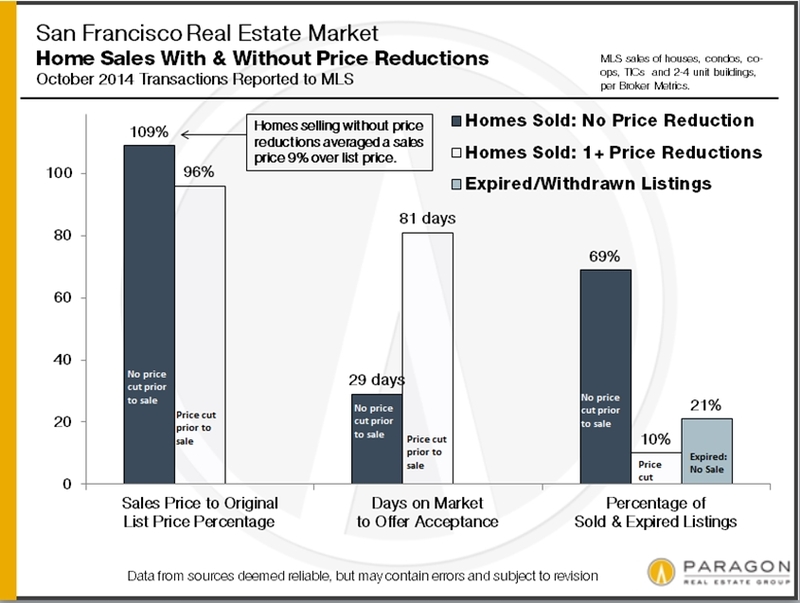 This first chart looks at SF houses, condos, co-ops, TICs and 2-4 unit buildings, breaking down sales by those that sell with and without price reductions, and the difference that makes in sales price and average days on market. 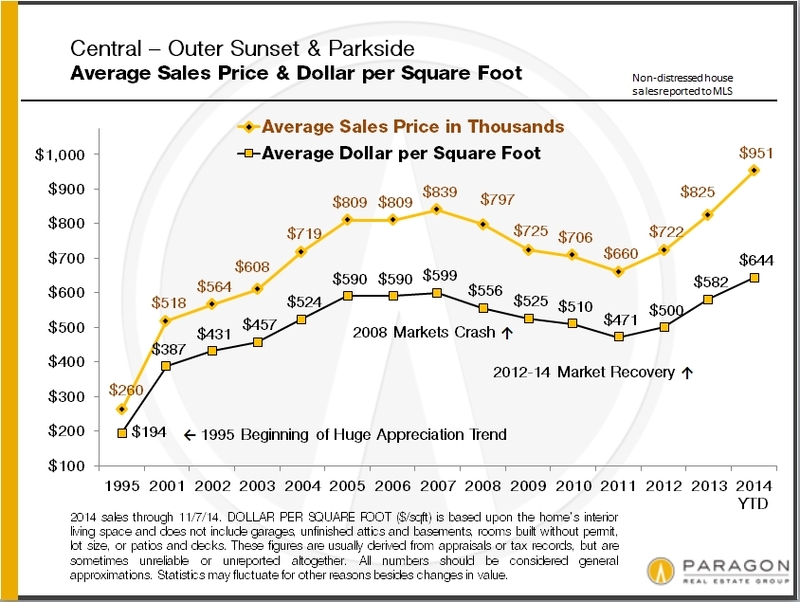 Pricing correctly right from the start reaps significant rewards for sellers. 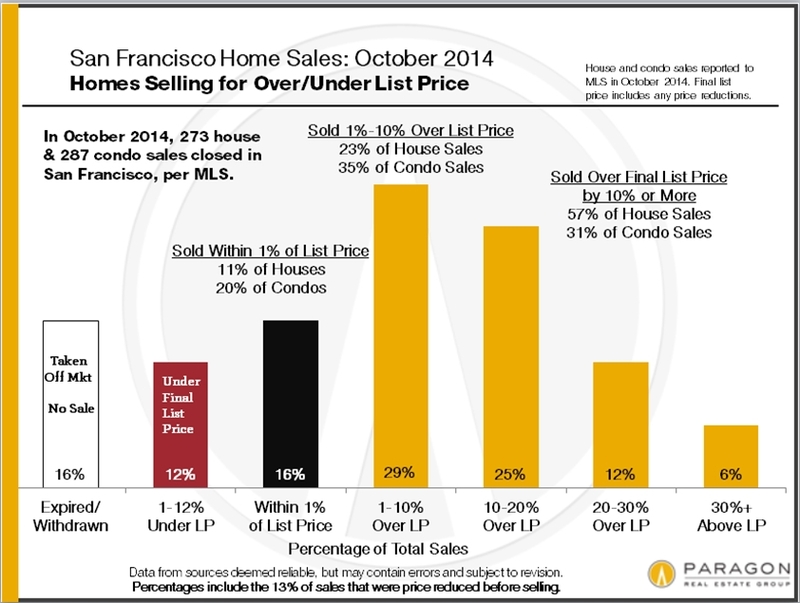 This chart breaks down SF house and condo listings by the percentage of list price achieved upon sale. Even if the autumn market isn’t as white-hot as last spring’s, these are incredible statistics. It should be noted that some of this phenomenon is certainly due to strategic underpricing of homes by some listing agents, which became increasingly popular in 2014. 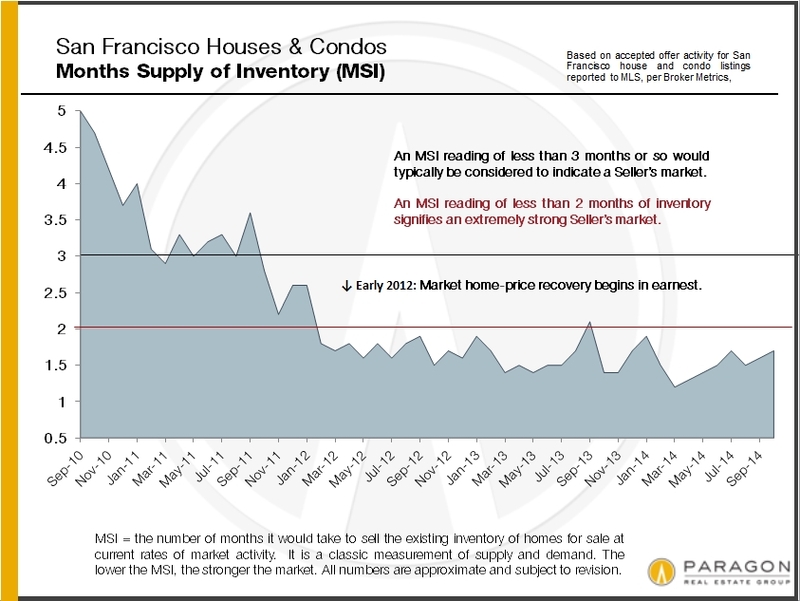 Months Supply of Inventory (MSI): At just under 2 months of inventory, San Francisco’s MSI is up from spring 2014, but still indicates a very strong seller’s market. 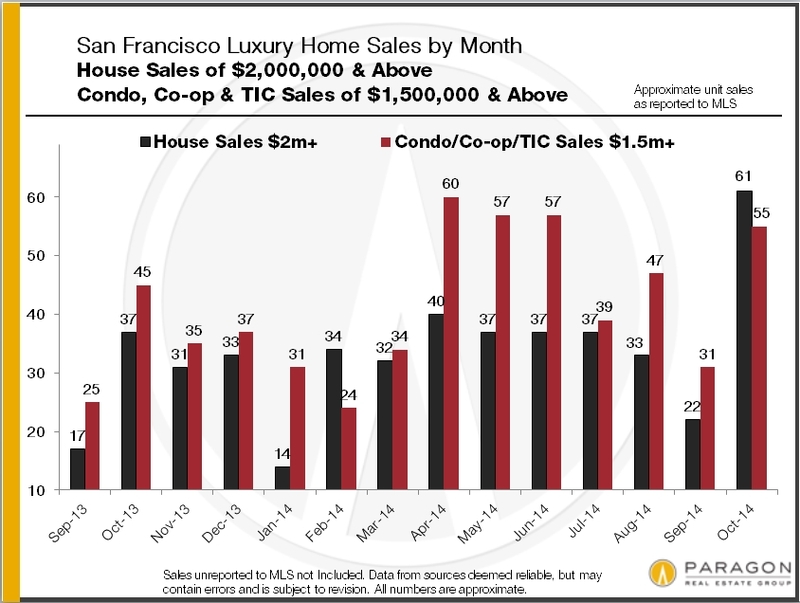 Luxury Home Sales Soar Again: October saw a big autumn surge in luxury home sales: It was by far the biggest month ever for SF house sales of $2m+, with 61 sales. Luxury condo sales were also quite high at 55 sales, a figure which doesn’t include market response to the new “ultra-luxury” Lumina project in South Beach, where 80 to 100 very expensive condos went into contract amid almost frenzied bidding – these units won’t close escrow until construction is completed in 2015 or early 2016. The average days-on-market (DOM) for luxury houses sold in October was 21 days, and for luxury condos, it was 28 days: These are very low DOM figures, indicating quick market response to the listings purchased. 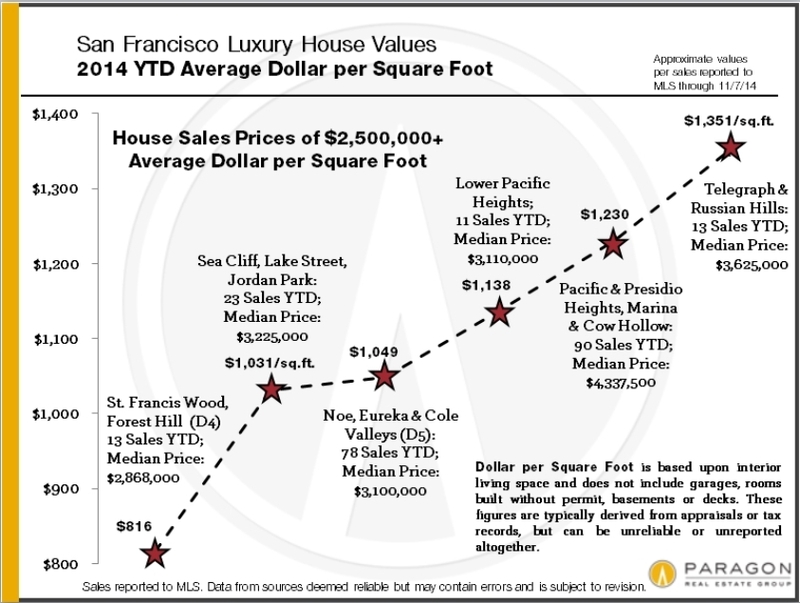 Luxury House Values: House sales of $2,500,000 and above, charted here by average dollar per square foot, cluster in a handful of areas in the city. 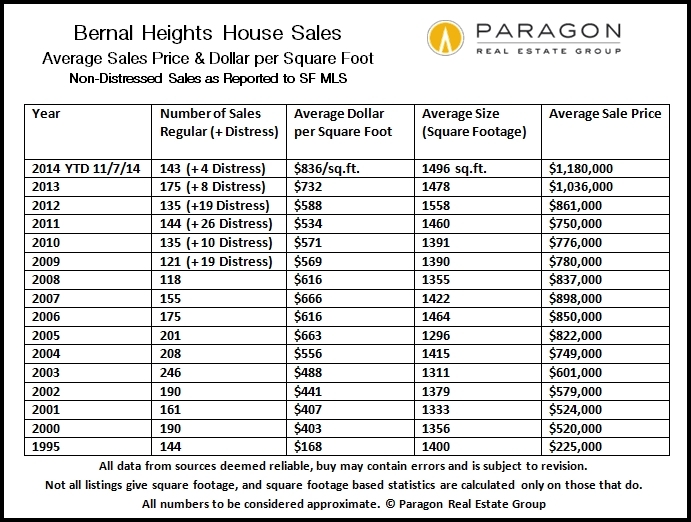 The Pacific Heights-Marina district has the most sales and the highest median sales price for such sales: Historically, this district has been the city’s nexus for big, luxury houses. 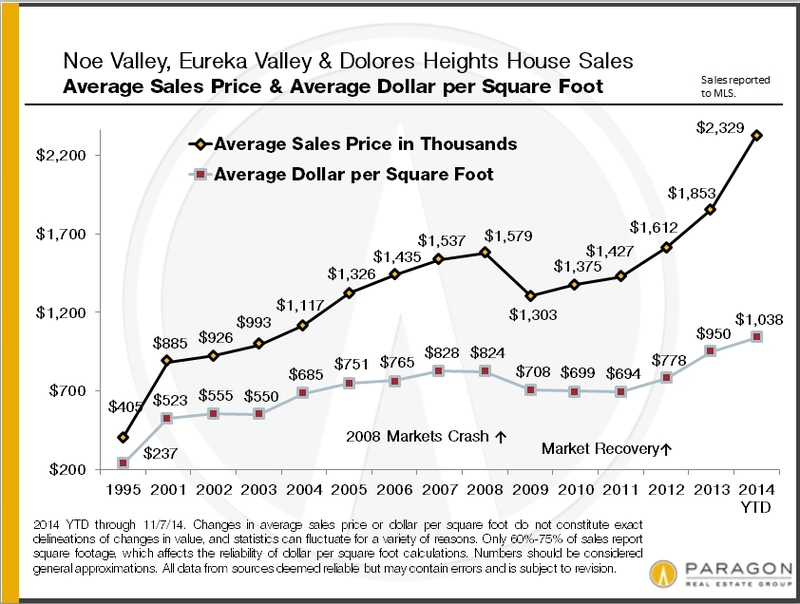 However, the greater Noe, Eureka & Cole Valleys district now sees a substantial (and growing) number of sales in this segment, though at a significantly lower price point. This area is becoming popular with the young, high-tech, ultra-wealthy (such as Mark Zuckerberg) and record prices are being achieved. Russian & Telegraph Hills have very few house sales, but very high values, as seen below. And the greater St. Francis Wood-Forest Hill area is by far the best value for big homes (often on big lots) by how much house you get for your money. Average house size varies from approximately 2700 square feet in Russian & Telegraph Hills to 3260 in Noe, Eureka & Cole Valleys to 4200 in Pacific Heights-Marina. All things being equal (which they rarely are), a smaller home will typically sell at a higher dollar-per-square-foot than a larger one. 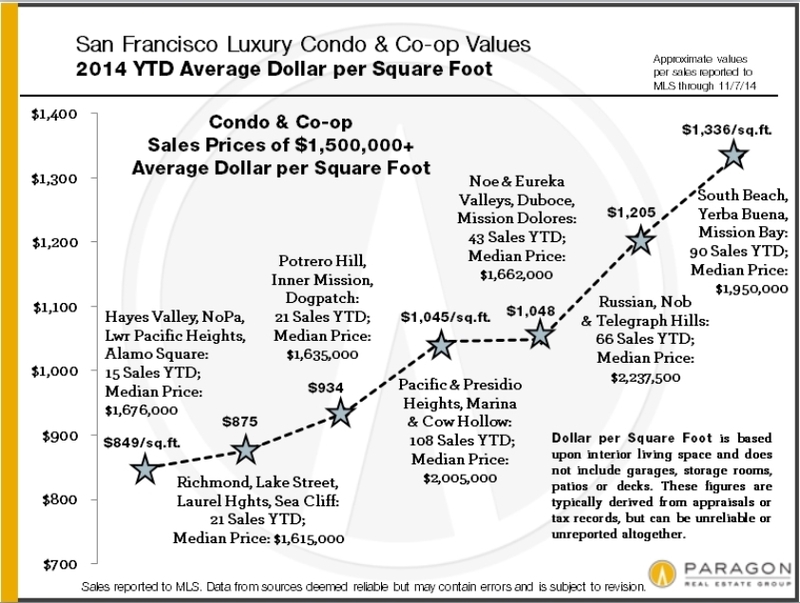 Luxury Condo & Co-op Values: The Pacific Heights-Marina district currently has the most luxury condo and co-op sales – but not for long: With all the new, high-rise condo construction in the greater South Beach-Yerba Buena district – already featuring the highest average dollar per square foot values in the city – this new residential area will soon dominate sales volume too. The prestigious condo and co-op neighborhoods of Russian, Nob and Telegraph Hill also feature some of the most expensive units in San Francisco. With new, luxury condo construction surging across the city, such sales – at very high dollar per square foot prices – are growing in neighborhoods such as the Mission, Hayes Valley, Duboce Triangle, Mission Dolores and Potrero Hill – and there’s a lot more coming. 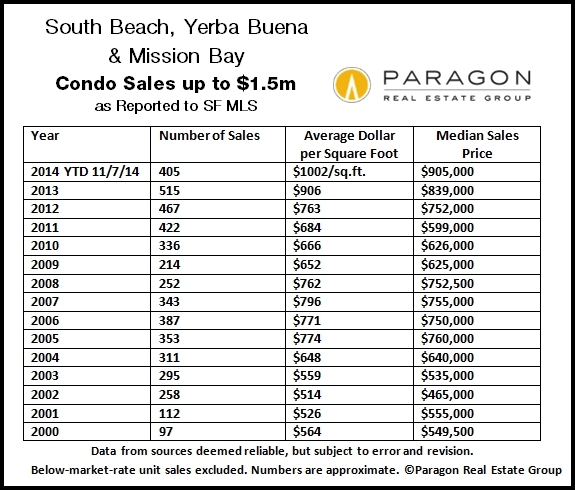 Average unit size for luxury condos ranges from about 1650 square feet in South Beach/Yerba Buena to 1900 – 2100 square feet in the older, northern neighborhoods such as Pacific Heights. Older buildings usually feature larger units. Perhaps as many as 30-40% of luxury units in the city are being purchased as pied e terres and second homes by the very affluent, or even as investments (often by wealthy foreign buyers). These two charts come from our recent report on Bay Area Demographics, covering issues such as ancestry, income, housing and education. 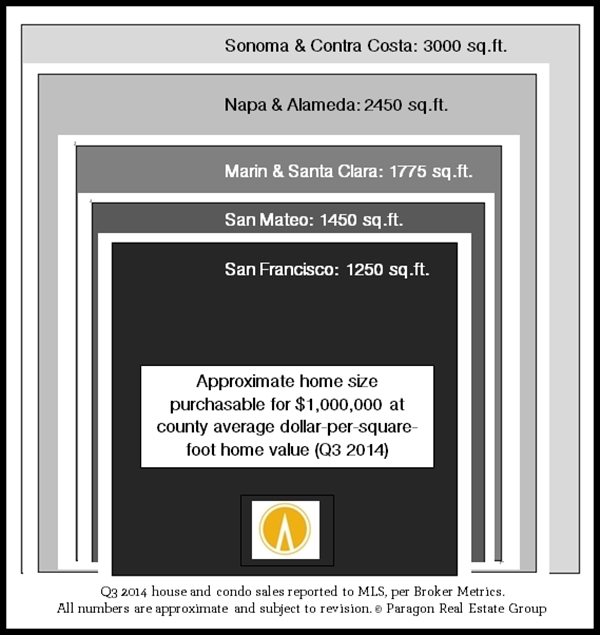 Square Footage for $1,000,000: At average county values, you’ll get double the square footage in Sonoma and Contra Costa as you will in San Mateo and San Francisco, and, of course, in other parts of the country, that can double or triple again. 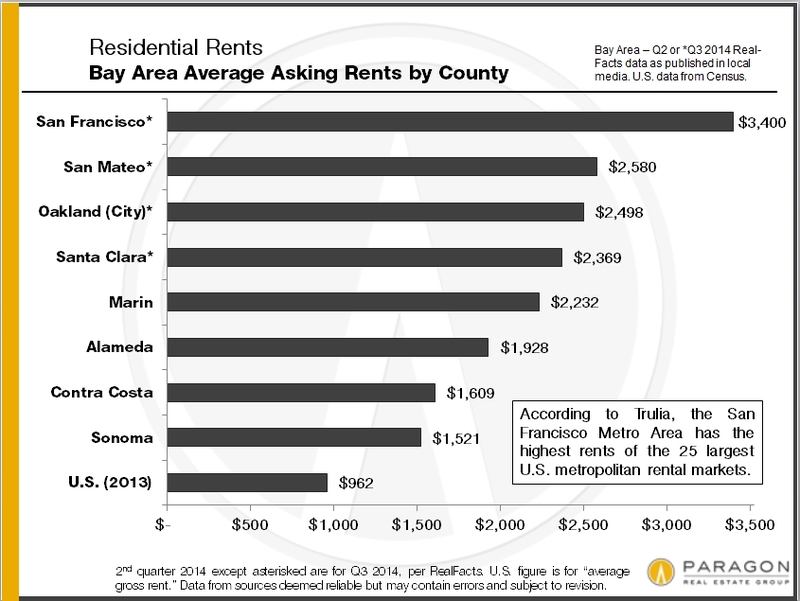 Average Asking Rents: In terms of rental-rate appreciation, the Bay Area has 3 of the 4 hottest rental markets in the country in Oakland, San Jose and San Francisco. High rents, of course, are one of the big factors behind high home prices. 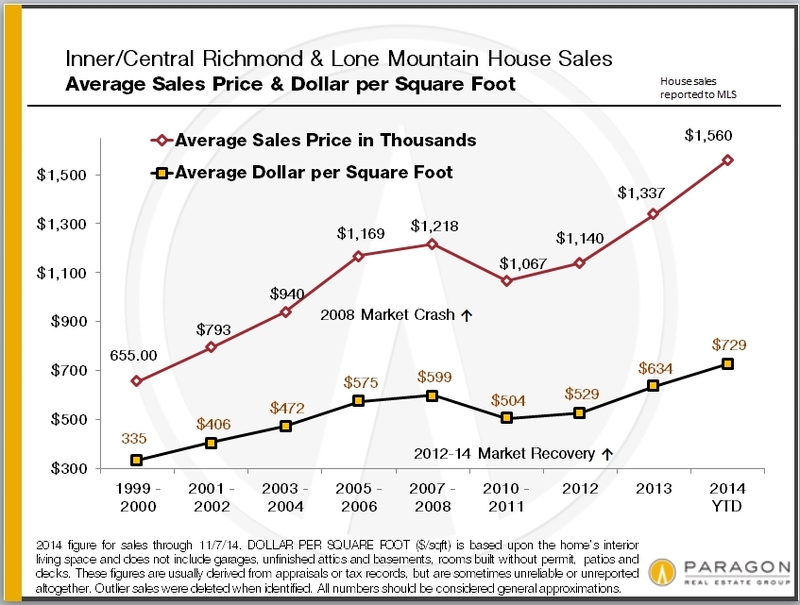 A look at long-term home-value trends in selected city districts. Please call or email if you’d like information on another neighborhood. Median and average statistics are generalities which summarize a huge range of underlying, individual sales.